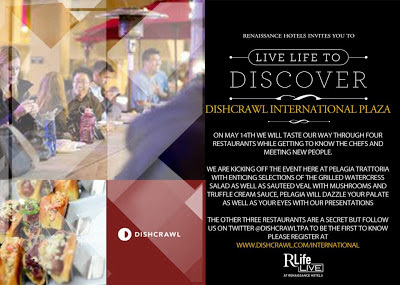 Have you heard about Dishcrawl yet? Dishcrawl is basically a tour for foodies. You pay for your tickets, stay up all night the night before in anticipation, meet at the predetermined location and then proceed on a culinary tour of carefully chosen dishes at different restaurants in the area. You will meet amazing chefs and local foodies and eat some of the best food in the area. That is my idea of a great night out! This coming Tuesday (May 14th) is the Dishcrawl for International Plaza at 6:45pm in Tampa. Normally most of the restaurants are a surprise until you actually get to the event; but I have a preview for you. Three of the four restaurants will be: Pelagia Trattoria, Capital Grille and Le Macaron. I love two of those and have been dying to try the third. Dishcrawl definitely hit on the key notes of International Plaza in my opinion. Now, for a sneak preview. Warning: these pictures and menu will make you hungry! Wow! That looks incredible. I am SO jealous of anyone that gets to attend next Tuesday. I sadly can not get off of work to go, but I will be attending a Dishcrawl next month. Tickets for the International Plaza Dishcrawl are $45 and are very limited. With the Discount Code: TFL you can save $5 and get your ticket(s) for just $40! That is a great deal considering all of the food and the experience you will be getting. This would also be a cool Mother's Day gift if your Mom enjoys eating out. Follow Dishcrawl Tampa on Twitter at @DischCrawlTPA for updates, hints at menu items and future events (St. Pete is coming soon!). You can also follow Dishcrawl Tampa on Facebook. For my international readers, Dishcrawl is all over the US and Canada! Go here to see if your city has a Dishcrawl and if not, request one.